The efficient way to save you time and money. If you have a fire alarm in your premises, you’re probably going to have other fire safety solutions such as emergency lights and fire extinguishers. You may also have an intruder alarm and even CCTV. Save the headache of dealing with multiple companies and get all your solutions solved under one roof. Less paperwork, fewer visits and one contract with one trusted team to call for all things fire and security – the All-in-One Solution is a no-brainer. You are paying too much and wasting too much time by dealing with more than one company for your fire and security solutions. We’ll help you decide which maintenance package would suit your business’s needs, so you’re getting the most suitable level of cover and protection. Save without cutting out quality. You’ll get the same great WFP service spread across all of your fire and security systems and products. Save yourself hours of admin time and waiting around for numerous engineers with WFP. Speak to us today about saving time and money with the All-in-One Service. 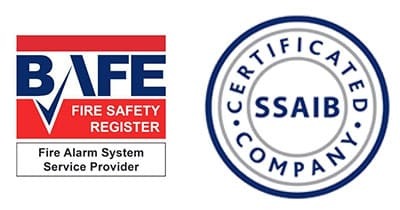 WFP is BAFE approved to design, install, commission and maintain fire alarm systems under the scheme SP203-1, and SSAIB certified to install and maintain security and CCTV systems. By choosing us to install and/or maintain your commercial fire and security systems, you are trusting competent specialists who will ensure you comply with UK Fire Safety Law.